We have a large cargo container in back and anything donated that is ripped, torn, stained or otherwise unsaleable or unusable in the clothing bank goes here, instead of to our local landfill. After it is full, Charity Shoes of Dallas, Texas parks a semi-trailer next to our clothes trailer and we have to hand-fill it and are always looking for able bodies to form a line and complete this task. Charity Shoes pays us around five cents a pound for these clothes and they distribute them to the needy in third world countries and we normally make around $400 for a full load. We have a trailer load going out every 4-6 months and loading days are usually an early morning weekday due to transportation issues. If you would like to be placed on a call list to help us load, please email the manager@silvercitygospelmission.org or watch our Facebook page for loading days and times. We supply water and for large groups we will try and do some type of lunch event. Weekend loading times are possible, but we need to make arrangements in advance. 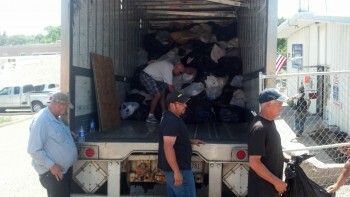 Share the post "Charity Shoes Semi Trailer Loading"